Sport is a beautifully horrible thing. For every winner there is a loser, for every elation there is heartache, for every missed opportunity there is a reward. They might be years apart, but things tend to level out on the playing field. If it wasn’t for the horrible losses, I’m not sure that I’d be as invested in sport as I am. Thankfully my selection of sporting teams has always been there to remind me there is more failure than success. As a nation we’re seen as a sporting prowess, which is awful kind according to the people who haven’t walked a mile in our shoes. An honourable mention to Tony Vidmar who played a huge part in what would be the 6th entry on this list. According to my research, I’ve spent 10,349 days living and breathing. 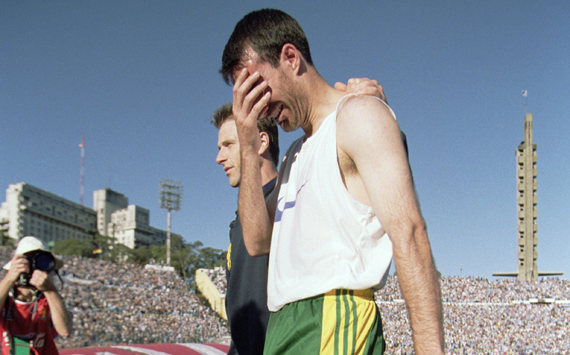 Sport has been there from the start and one constant has been that heartbreak is just around the corner. It’s with a heavy heart I write this list, as this morning the Boomers were unfortunate enough to not only add another chapter, but to give the top spot a nudge. This of course, has pushed me towards one question – What are the five biggest heartbreakers I’ve had the pleasure of experiencing thanks to a national sporting team? 1.Australia V Iran (Football), 22nd November 1997 – I hope this remains the worst thing I ever experience from a team in green and gold. A two-goal lead, 20 minutes left and a first World Cup in 24 years. Nothing could possibly go wrong, to the point where my dad told me I could safely go to bed. I woke up the next morning euphoric, we were off to the World Cup – the promised land. I’d heard the stories of heartache that my dad had experienced for 24 years and I was fortunate enough to have avoided them. Dad looked like he’d seen a ghost when he got up, and I simply couldn’t believe it. Eight years more heartache was waiting for me. I hate you Peter Hore . 2.Australia V Spain (Basketball), 22nd August 2016- If someone offered me one bad game from the Boomers and a top four finish two weeks ago, I’d have bitten their arm off. This is unquestionably the best Boomers outfit of my life. Halfway through the second quarter we were gone, but we found something. Baynes and Mills helped us put together a run and we had the lead multiple times in the fourth quarter. The one missing thing was back-to-back buckets when we had the lead. We had no trouble getting stops but we just couldn’t convert. Foul or no foul with five seconds left, watching the ball squirt into the backcourt as time evaporated at a rate of knots left me feeling sick to my stomach. 3. Australia V England (Rugby Union), 22nd November 2003 – I hope somebody decides Australia never again play sport on November the 22nd. If Elton Flatley’s conversion attempt of Lote Tuqiri’s try in the 4th minute comes off the inside of the post, we win. The rest of the game doesn’t change because the ball is kicked off in the same manner and we win 19-17 instead of losing 20-17, thanks to none other than Jonny Wilkinson, who kicked a drop goal in dying stages of extra time. The confidence from the squad and the media had made me believe for the entire week leading into the game that it was a forgone conclusion. I have absolutely no shame in admitting that a few tears escaped as that perfectly executed drop goal sailed right over the black dot. 4. Australia V Italy (Football), 26th June 2006 – The scene of the Tim Cahill show against Japan, a win against Italy would have afforded us the opportunity to play Ukraine, followed by Germany, followed by France. Call me a dreamer, but I thought we could go all the way. With a man advantage, we couldn’t penetrate the Italian back four for all the steins in Munich. A Fabio Grosso dive combined with a poorly timed Lucas Neill lunge and Totti used the last kick of the game to ruin something I thought I’d been through hell to see (see the clubhouse leader on this list and honourable mention Uruguay in November 2001 for further information). There is still nothing better than seeing Italy knocked out of a major tournament. 5. Australia V South Africa (Cricket), 5th & 6th of January 1994 – Chasing 117 at the Sydney Cricket Ground should be an easy task for the likes of Waugh (M), Boon, Border, Taylor and Slater. Especially when facing a bowling attack including a (very young) Allan Donald, De Villiers and Symcox. So how do you go from 2-51 to all out for 111? Losing 5-22 doesn’t help, and nor does having Craig McDermott top scoring with 29*. At least that collapse was a blip on the radar as we went on to be one of the most successful sides of the next decade. I did not enjoying finding or watching any of these videos. Viewer discretion is advised. I’d love to say that this has been a fun list to write, yet all it has done has made me question why I love sport so much, while clearly reiterating that the reason for the emotional investment is because there is no shortage of positives for each of these experiences. Long live sport and I hope this list never changes. This entry was posted in Published on xavierplayer.com and tagged Basketball, Cricket, Football, Olympics, Rio 2016, Rugby Union. Bookmark the permalink. The sun rises in the West.